Heat Lamps are used for warming, heating and dryong of samples without the heat source coming in contact with the heat load. 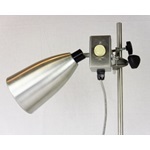 The Heat Lamp is ideal for a variety of heating or drying applications in the lab. With the variable voltage control, you can turn up or down the intensity of the lamp.